Couldn’t swing a ticket to this weekend’s Aerosmith/J. Geils extravaganza at Fenway? You should have been at Olivers the other night. Neither Steven Tyler nor Peter Wolf were on the bill, but reasonable facsimiles of their bands were. The all-female cover band Aerochix blasted all your Aerosmith faves, while Blow Your Face Out, led by Dave Tree, rocked it Geils-style. Governor Deval Patrick’s reelection campaign is getting some major star power. Haitian hip-hopper Wyclef Jean and soul singer John Legend plan to perform at a fund-raiser tonight for Patrick and Lieutenant Governor Tim Murray at a private residence outside Boston. Legend was a big draw for Barack Obama’s 2008 presidential campaign, and Jean — who’s been taking classes at the Berklee College of Music — is popular in Boston, which has a sizable Haitian-American community. Maybe Jean’s appearance is a political warm-up; last week he announced he’s running for president of his earthquake-ravaged homeland. Foxborough-bred pop star JoJo stopped backstage at Staples’s Do Something 101 event following the Teen Choice Awards in LA. The singer, sporting black hair these days, was among several celebs — Nikki Blonsky, “Chuck’’ star Zac Levi, Lucy Hale, to name a few — who joined teen volunteers in donating 500 gift bags of school supplies to needy kids in LA. JoJo was greeted backstage by Staples’s Boston-based publicist Karen Pevenstein. Winthrop Roosevelt, the great-great-grandson of Theodore Roosevelt, was at the Steiff Gallery at the Atrium Mall the other day, where he chatted with Caroline Schwarz Schastny, the great-great-granddaughter of FAO Schwarz. Why, you say? The world’s most priceless teddy bear is on display at the gallery, and the teddy, of course, is named for the former president. Also there was Friedrich Lohr, Germany’s consul general in Boston. The World Cube Association’s 2010 US National tournament at MIT this weekend ended with defending champion Rowe Hessler triumphant, with an average time of just 10.93 seconds, in the speedsolving of the classic three-by-three puzzle cube. The tournament, which event organizers said was the biggest of its kind yet held in the United States and one of the largest in the world, brought about 250 competitors to Cambridge. Solving the classic cube was just one event in which cubers used their minds, hands, and even their feet to wrestle with Rubik’s Cubes of various configurations as well as similar puzzles. Two of the artists in “Boston’s 25 All-Time Best Pop Music Acts,’’ a list published in Sunday’s Boston Globe Magazine, say they would rearrange the ranking. Told that Aerosmith landed at the top spot, guitarist Joe Perry heaped praise on the group that came in at No. 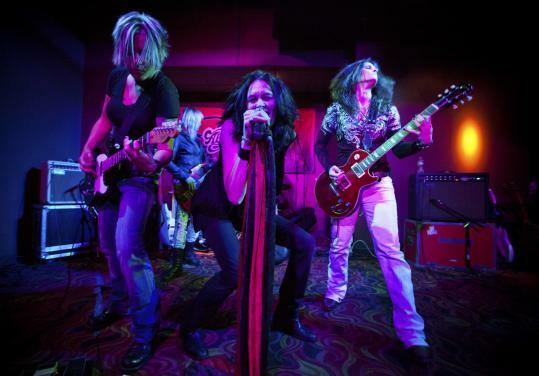 6 — the J. Geils Band, Aerosmith’s partners in rhyme at Fenway Saturday. “I always thought J. Geils was the best live band on the planet, probably next to Sly and the Family Stone; they were unstoppable.’’ He added with a smile, “I probably would’ve picked them, but I’m glad to be No. 1.’’ Donnie Wahlberg, member of the No. 9 New Kids on the Block, also would have slotted a different group at No. 1. His choice? “I would’ve put New Edition at No. 1 and Aerosmith at No. 2,’’ he said of NKOTB’s boy band predecessors, who came in just ahead of New Kids at No. 8. Keep an eye out for the boys in the band OK Go, who are shooting a video in Cambridge for their song “Last Leaf.’’ We’d like to tell you more, but word is everyone signed a confidentiality agreement. The band, which was born in Chicago and relocated to LA, places a heavy emphasis on video. The vid for its song “Here It Goes Again,’’ featuring band members Tim Nordwind, Dan Konopka, Andy Ross, and Damian Kulash on treadmills, has registered more than 52 million hits on YouTube. WCVB-TV (Channel 5) anchor and reporter Liz Brunner married Boston businessman Craig Stockmal last week in a private ceremony in New York. Geoff Edgers of the Globe staff and Globe correspondent Taylor Adams contributed to this report. Read the Names blog at www.boston.com/namesblog. Names can be reached at names@globe.com or at 617-929-8253.